Not a White Sox, but a camo numbered 98/99. The scan makes the name FAR easier to read than in person. Camo + foil = bad. Check off another insert from the list. Just need to pull a pink border, cuz I highly doubt I'll snag a platinum. Nice pull. I've pulled two camos - a Brian McCann from a WalMart cereal box and an Adam Jones from a Target. 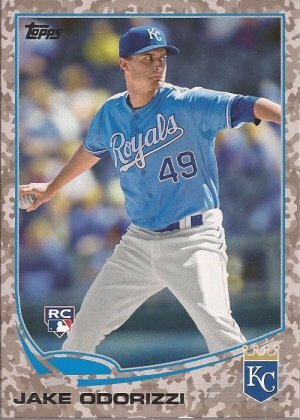 I also just wrote up a post about my recent successful forays into WalMart retail packs - featuring White Sox. I only bought one from Target, but it produced more than the couple I got from Wal-Mart. I got a camo parallel and a Verlander "game used" relic Chasing History in the same pack. Do you have any Red Sox parallels from this year?